Julian Edelman may be an unlikely star but his consistent success with Tom Brady and the New England Patriots dynasty has thrust his name into the Hall of Fame discussion. While he still has more work to do to make this a reality, the Super Bowl LIII MVP award certainly helped his case. 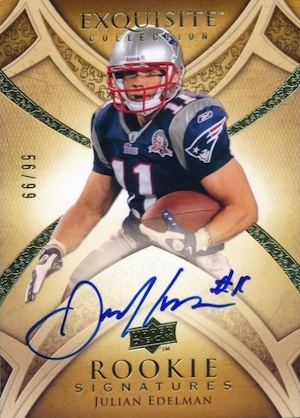 This has also boosted the market for Julian Edelman rookie cards. Picked in the seventh round of the 2009 NFL Draft by the Patriots, the undersized wide receiver actually played quarterback at Kent State and College of San Mateo before switching positions at the pro level. After a few years in transition, he became a favorite target of Tom Brady starting in 2013. 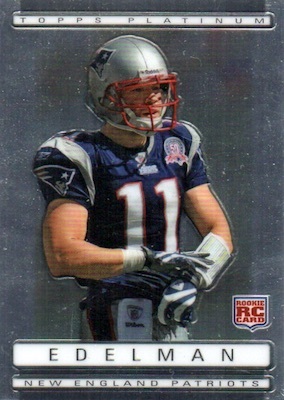 View the Julian Edelman card auctions with the most bids on eBay. 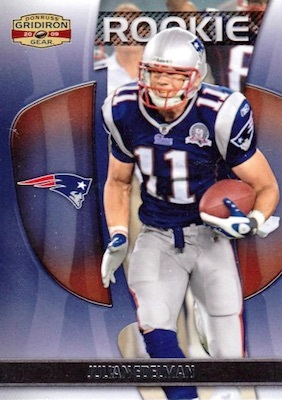 Given his late selection in the NFL Draft, there are only a few Julian Edelman rookie cards. Of the eight main choices, six are numbered to 999 or less and four of the cards are signed. The full Julian Edelman rookie card checklist is detailed below. Shop for individual cards or check prices on eBay by using the links below. 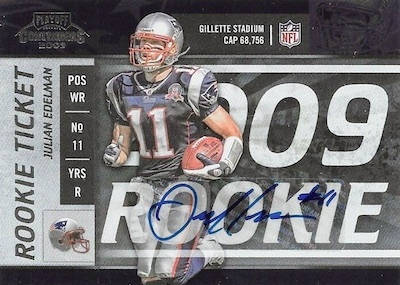 Although one of the most basic Julian Edelman rookie cards, the 999 print run keeps supply lower than might be expected. There are also a few "X" and "O" parallels in 2009 Gridiron Gear, including Silver (#/250), Gold (#/100) and Platinum (#/25). Given the extreme popularity of the Contenders Rookie Ticket line, it doesn't matter that the 2009 Contenders card has a crowded and busy design, a sticker signature and an unknown print run. 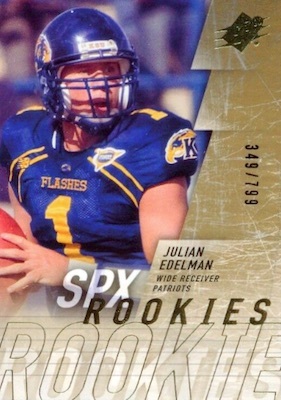 It is still one of the best Julian Edelman rookie cards out there. NT is another notable brand in the hobby and that helps this sticker autograph rookie stand out a bit more. However, with just 99 copies, these are not seen very often. 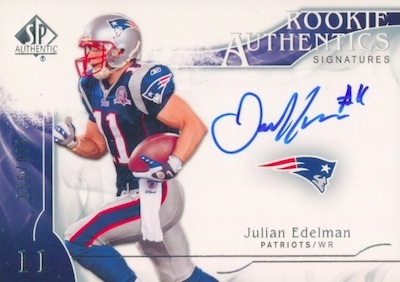 Based on supply and overall appeal, 2009 SP Authentic offers one of the top Julian Edelman rookie cards. The 999 print run is downright massive compared to most of his other signed choices. And when you combine that with an on-card signature and solid design, you get a great rookie card that isn't impossible to find. Reaching back to his time as a quarterback in college with the Kent State Golden Flashes, the 2009 SPX Rookies subset for Edelman is limited to 799 copies. The Silver parallel brings that down to 399 and the Gold Holofoil version has just 25 copies. 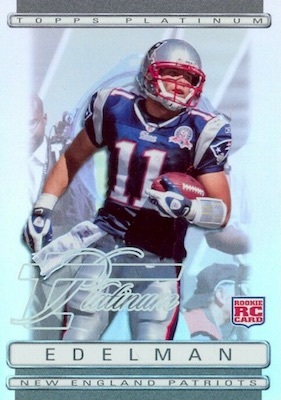 2009 Topps Platinum is home to the most common Julian Edelman rookie card. Done in a standard chromium style, there are multiple Refractor parallels numbered to 999 or less. 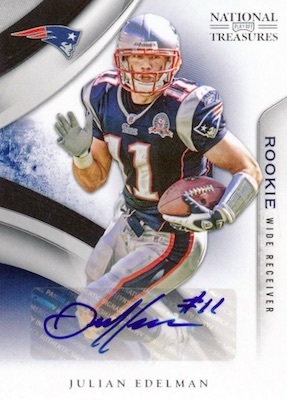 Edelman also has a rainbow foilboard Platinum variation with an action image. These are numbered to 1,549. 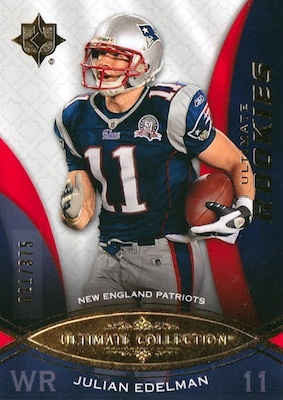 If you could pick any Julian Edelman rookie card, the 2009 Exquisite Collection card from Upper Deck is the likely winner. Numbered to just 99, the on-card Rookie Signatures autograph carries big brand awareness and a high-end style sure to impress. Another Upper Deck release, 2009 Ultimate Collection is also fairly limited at 375 copies. It makes a good consolation prize if you want something rare but don't want to pay for an autograph. Although, the difficult part can be tracking one down.